Posted 1905. 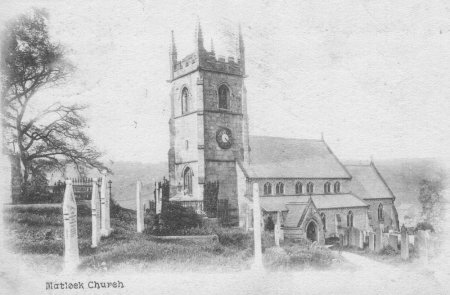 Addressed to Mr G Robinson, 173 Gt Jackson St, Hulme, Manchester from Bert (son). 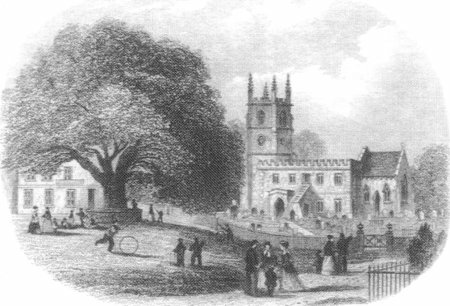 No Lady Chapel shown, so taken before 1898. Posted 1904. 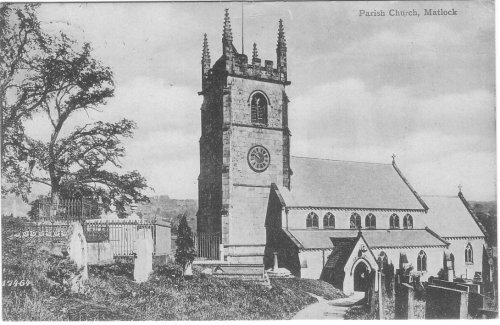 No Lady Chapel shown, so taken before 1898. Posted 1913. Trade postcard advertising a wood preserver. 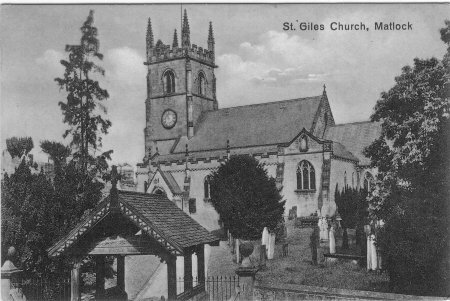 St Giles Parish Church, 116 Church St, Matlock DE4 3BZ, 01629-582-199. 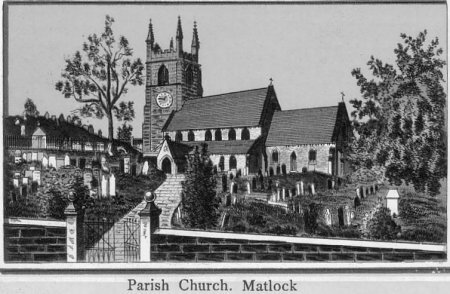 Matlock Parish included Matlock Bath with Scarthin until 1843, Lumsdale, Matlock Cliff and Riber (transferred to the parish of Tansley in 1865) and Matlock Bank until 1886. 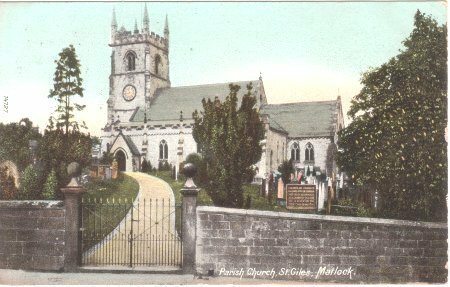 Parish Registers from 1637 are held at Derbyshire Record Office 01629-585-347. 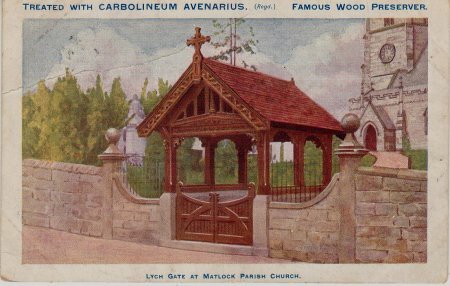 The Lychgate was erected in 1908. 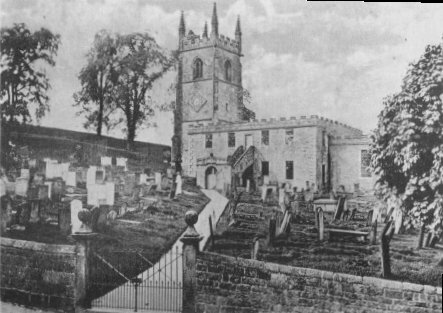 It derives from an Old English name for a corpse, and the roofed churchyard gate was used to rest the bier under, while permission was gained to enter the church. 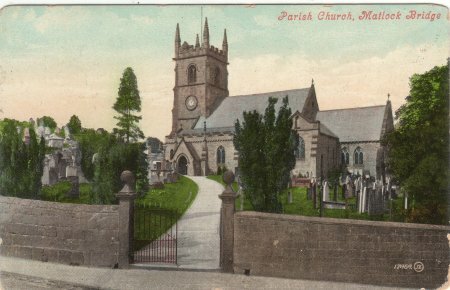 The stone gate posts were also moved outwards and the wall altered. 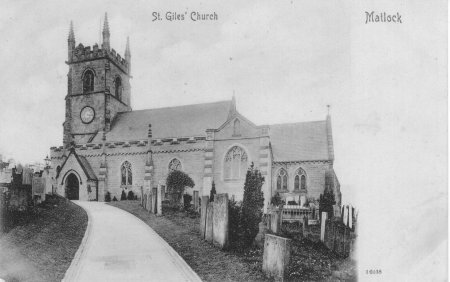 The fifteenth Century Church underwent considerable alterations in 1859 and 1871, and in 1898 a Lady chapel was added. The sign seems to read "Children are forbidden...", presumably from playing in the Churchyard. 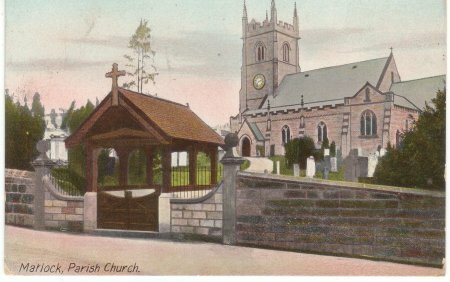 Posted 1906, notice reads "Children are forbidden..."
Unposted, taken after 1908 (Lych gate built).